The road to safer driving starts here. Get SyncUP DRIVE™ for only $72. Buy yours today for as little as $3/month on our Equipment Installment Plan! Connect your SyncUP DRIVE with an unlimited data plan starting at $10/month with Autopay. If you cancel wireless service, remaining balance on device becomes due. SyncUP DRIVE Device: Limited time offer; subject to change. $0 down + $3 mo. x 24 mo. (FRP $72). 0% APR. Plus tax. If you cancel service, remaining balance at full price becomes due. Pricing for well-qualified customers. Qualifying service required. Capable smartphone, 3rd party app, and service required for some features. Turn your car into a Wi-Fi hotspot. Stream, call, and text on up to five devices. Qualifying plan and capable devices required. Monitor family driving behavior and set speed alerts—even when you’re not there. Capable device, service, and app required. GPS signal required for vehicle tracking. Maintenance reminders, recall information, fuel levels, battery life, car trouble alerts, and more can be sent straight to your phone. Track all your cars on one map. Boundaries and trip reports let you keep tabs on every driver in your family. Allstate® Motor Club is included at no extra cost. Capable device, qualifying service in good standing, and third-party app required. Third-party terms of service apply. Contact Allstate or visit www.roadsidemobile.com/tmobile for details. 24/7 Roadside assistance is just a call away. Included with SyncUP DRIVE™ for customers on a qualifying Wi-Fi mobile internet data plan. Existing and new customers automatically eligible. Simply agree to Allstate® Motor Club’s terms of service to activate your Roadside Assistance and take advantage of one of the largest and best-organized road service networks in the country. Your Allstate Motor Club membership begins within 48 hours after you accept these terms in the SyncUP DRIVE mobile app, and continues as long as you’re in good standing with your T-Mobile plan for SyncUP DRIVE. Roadside-assistance services and benefits provided by Allstate Motor Club, INC.
Plug in the on-board diagnostics reader. Use the compatibility checker below to find the OBD-II port in your car. Use the app to keep track of your car. 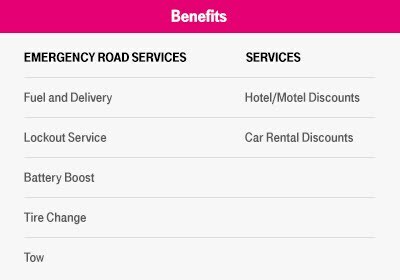 Now available in Spanish, SyncUp DRIVE™ allows you to access maintenance information, car location, and more—straight from your phone. Keep your family and car safe with SyncUP DRIVE. Stay entertained and productive on the road. Check on your loved ones with ease. The host of Designing Spaces tries SyncUP DRIVE. Set it up in three simple steps. Control your fleet with smart reporting. Track and improve your driving habits. Get car trouble alerts on your phone. Keep an eye on your car when you’re away. Find out if your car is compatible. Requires an OBD-II (on-board diagnostics version 2) port, found in most models 1996 or newer. Be advised! SyncUP Drive is not compatible with your vehicle.